The Village of Montgomery was given an award Thursday by The Conservation Foundation in recognition of its on-the-ground conservation efforts over the past 40 years. To celebrate their 40th anniversary, The Conservation Foundation of Naperville selected 40 partners whose work has helped accelerate the foundation’s mission—to preserve and restore natural areas and open space, protect rivers and watersheds, and promote stewardship of our environment. Montgomery has always prided itself on its agricultural history and identified the Dickson-Murst Farm early as “the one to save” because it is an Illinois Sesquicentennial farm. When development hit the area in 2004, the Village stipulated that the developer must give the Village two and one half years to find an organization to take over the four acres of land containing the farm buildings. In June of 2006, the Village sold the property to The Conservation Foundation for $10. Today, the Village continues to actively support and work with the Conservation Foundation. Examples of this include the Village’s Rain Barrel program and land planning efforts. 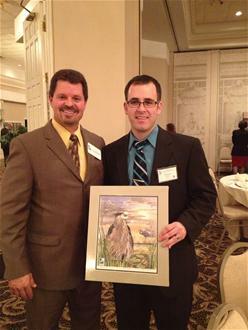 For more information on the awards, please visit The Conservation Foundation website at www.theconservationfoundation.org. Village President Matt Brolley has issued a statement on the passing of Village Trustee Stan Bond. We support the Special Olympics of Illinois!